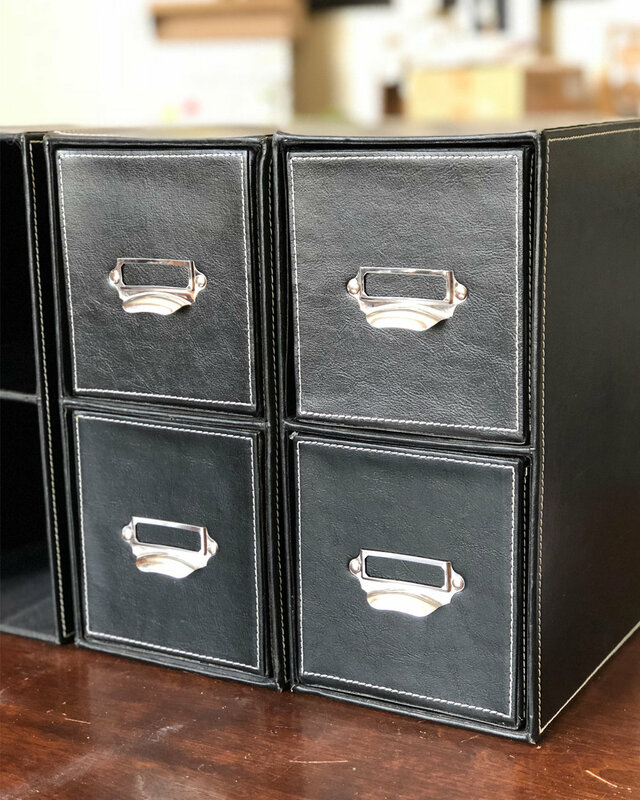 Ever since that makeover, I’ve been searching for just the right file boxes and small storage boxes to go with my filing cabinet, but THEY COST A FORTUNE! Even for the cardboard ones. While cleaning out a closet the other day, I came across a bunch of black leather boxes I’d totally forgotten about. I love when stuff like that happens! I saved them because they cost me an arm and a leg fifteen years ago (I know, I’m a hoarder—don’t judge), but I shoved them in a closet when I decided black was out. These boxes were exactly what I was looking for--they just needed to be pink. Everything I'm about to share works for leather, pleather, naugahyde, vinyl, etc. …but when I opened the jar, it was the consistency of frosting! The awesome thing about using BB Frösch Chalk Paint Powder to create your own chalk/mineral paint is that your paint won’t harden. It CAN thicken over time once it is mixed, but, believe it or not, it is still usable! I shared details about why stored paint thickens and three solutions to solve it on Instagram. Just click on the highlights from your phone. Although I was able to use the paint I had already made, I still ended up mixing a new batch because I had ten boxes to paint! Behr Paint color-matched to Benjamin Moore "Pacific Grove Pink"
***It is worth noting that, had I originally mixed my powder with Benjamin Moore paint, it would NOT have thickened! All Behr paint contains primer, which won’t affect the awesome properties of your mixed paint, but it will cause your paint to thicken more when stored. I just live a lot closer to Home Depot than to my local Benjamin Moore store, so I went with a Behr sample jar of paint for $2.97. First, I taped off all the silver parts and sprayed them gold. Painting hardware on furniture is so much easier because you can just remove it. Taping off was the most time-consuming part of this project. Next, I painted all the boxes pink, which, of course, I forgot to photograph. However, you can see how I painted using the thick paint on my Instagram﻿ story highlight. I did 2-3 coats of paint—some areas needed a third coat and others didn’t. I used the same “hashtag” or “cross-hatch” strokes I use on regular furniture. This next step is IMPORTANTif you want your leather or faux leather to still feel like actual leather (as opposed to painted leather) when you’re done! Gently sand all the painted areas with 400 grit sandpaper. You can use a higher grit, but anything lower will distress, and you just want to smooth out. Even if you look super close, you'll notice the sanded areas don't show those hashtags strokes I always talk about--they just smooth right out! The last, and quickest step was waxing with BB Frösch Clear Premium Finishing Wax. When chalk painting leather, the combination of sanding and waxing are where the MAGIC is! I don’t have an area in the office where I can photograph all the boxes together, but that’s okay, because it’s a little heavy on the pink to have them all in the same spot anyway. I originally planned to paint the insides of the magazine boxes, but I had some scraps of material from Hobby Lobby that I used to line them instead. I just cut the fabric to fit and glued it in. I’m thinking that since I saved so much money on the filing cabinet makeover and painting my boxes instead of buying new, my husband should be on board with getting the navy velvet couch I want, right?